Leonel Kaplan is largely a self-taught musician, though he had taken informal jazz lessons for many years with legendary local free jazz trumpeter Enrique Norris. These formatives years were fundamental in his artistic development. 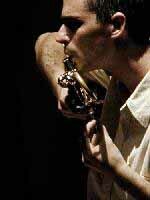 But it was the discovery of free improvisation which led him to understand how to take maximum advantage of those aspects of his instrument directly linked to air itself. Thus, the physical nature of the instrument and the presence of air as the bearer of sound became fundamental points of reference in his quest for a personal language in which he draws away from the tradition of the trumpet in order to draws ever closer to its nature. In this process, he also found himself as a musician. During the past years Kaplan has participated in multiple tours throughout South America, USA and Europe, including a series of concerts, recordings and festivals participations with improvisers such as Michel Doneda, Jack Wright, Axel Dörner, Xavier Charles, Bhob Rainey and Lê Quan Ninh between many others.